From the very beginning we tried to make the inspiring design of solar powered vessels which harmonises with the new technology of shipbuilding. Design is the matter of taste. The maritime solar design, which you can see hier, is intended for the future motivation. All design studies are merely unrealised ideas. But general all these ideas about solar vessels can be realised and the reality has proved this many times. The overview of colours and forms of solar powered vessels here doesn´t claim the completeness. Many new projects are being developed now and can not yet be introduced here. Let your fantasy freely run and we will help you to make true your ideas. The origin of the design of solar watercraft, always built on the idea to find for a new technology, a new stimulating design, which harmonizes with the new technology of solar shipbuilding. As a hull form here is mainly the catamaran in the foreground. Own rather practical designs by the designer J. Albrecht are possible. But also a close cooperation with a-em / -er industrial designer is possible. The well-known guideline and the motto of the design guild "design follows function" comes to bear here. Der Ursprung des Entwurfes von solaren Wasserfahrzeugen, baute immer schon auf dem Gedanken auf, für eine neue Technik auch ein neues anregendes Design zu finden, welches mit der neuen Technik des Solarshiffbaus harmonisiert. Als Rumpfform steht hier vor allem der Katamaran im Vordergrund. Eigene eher praxisnahe Designs durch den Konstrukteur J. Albrecht sind möglich. Aber auch eine enge Zusammearbeit mit ein-em/-er Industriedesigner/in ist möglich. Die allgemein bekannte Richtlinie und der Wahlspruch der Design-Zunft "design follows function " kommt hier zum tragen. The colorful design of the ferry was created in 2016 by the solar designer J. Albrecht and fits the "Berlin waters" where all sorts of colorful people have fun. 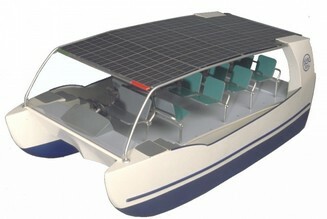 The boat is to be distributed via the SunBoat UG (www.sunboat.eu). A suitable specimen of the half-diver has already been made by a well-known Berlin shipyard of Märkische Bunker and Service GmbH. Das bunte Design des Fährschiffes wurde 2016 vom Solar-Designer J. Albrecht erstellt und passt zu den "Berliner Gewässern" wo sich allerlei buntes Volk vergnügt. Das Boot soll über die SunBoat UG (www.sunboat.eu) vertrieben werden. Ein passendes Probestück des Halbtauchers wurde bereits von einer bekannten berliner Werft der Märkische Bunker und Service GmbH angefertigt. The SunBoat 33 was designed by yacht designer J. Albrecht and is to be distributed by SunBoat UG (www.sunboat.eu). Das SunBoat 33 stammt aus der Feder des Yachtdesigners J. Albrecht und soll von der Firma SunBoat UG (www.sunboat.eu) vertrieben werden. The concept of the "Millenium One" as a solar hydrogen ship was worked out by the designer Prof. Ingo Schneider (University of Art in Berlin) and the naval architect Jörg Albrecht in 1999. The design can be realised as a passanger vessel for the coastal use for approx. 350 persons. The concept of "Millenium One" as a solar hydrogen ship was developed in 1999 by the designer Prof. Ingo Schneider (University of the Arts in Berlin) and the shipbuilding engineer Jörg Albrecht. The so-called retro fiction design can be realized as a coastal passenger ship for about 350 people. Das Konzept der "Millenium One" als Solar-Wasserstoff-Schiff wurde 1999 vom Designer Prof. Ingo Schneider (Universität der Künste in Berlin) und dem Schiffbau-Ingenieur Jörg Albrecht ausgearbeitet. Das sogenannte Retro-Fiktion-Design kann als küstentaugliches Fahrgastschiff für ca. 350 Personen realisiert werden. The small mobile vessels can be used in the downtown as a taxi. They are licensed with simplification because of limiting number of persons.It is only 12 passangers. Already in 1995, this design study was developed with the Kiel designer Jan Sokoll. It probably represents the world's first solar design in the field of solar watercraft. The small maneuverable vehicle can be used as a taxi in narrow canals in the inner city area of cities. By limiting to 12 people, significant simplifications would be achieved in the approval planning. Bereits 1995 wurde diese Designstudie mit dem Kieler Designer Jan Sokoll entwickelt. Es stellt wahrscheinlich, das weltweit erste Solar-Design auf dem Gebiet der solaren Wasserfahrzeuge dar. Das kleine wendige Fahrzeuge kann in schmalen Kanälen im Innenstadtbereich von Städten als Taxi eingesetzt werden. Durch die Begrenzung auf 12 Personen, würden wesentliche Vereinfachungen bei der Genehmigungsplanung erreicht. This solar powered vessel was developed by Jörg Albrecht as a modern own design in 2002. This solar ferry was developed in 2002 as a contemporary design by Jörg Albrecht. The ferry L = 10m; B = 3m, v = 14km / h; Pm = 2x7kW; Range about 100km is intended as a sea or river ferry for up to 20 people. Diese Solarfähre wurde 2002 als zeitgemäßes Eigendesign von Jörg Albrecht entwickelt. Die Fähre L=10m; B=3m, v=14km/h; Pm=2x7kW; Reichweite ca. 100km ist als See- oder Flußfähre für bis 20 Personen gedacht. This design was developed together with the architekt Prof.Ingo Schneider. It can be used as a coast vessel for 50 persons. This design was developed in 2002 with the designer Prof. Ingo Schneider. It is intended for a coastal suitable 50 person passenger ship. Dieses Design wurde 2002 mit dem Designer Prof. Ingo Schneider entwickelt. Es ist für ein küstentaugliches 50 Personen-Fahrgastschiff gedacht. The "Berlin´s water dacha" is the own creative design of Jörg Albrecht and was developed in 2001 for awater wanderer. Together with the nature and in the harmony can the wanderer enjoy spare time on the water. The big "veranda" on the bow gives a splendid opportunity to stay on the water or in the bays and observe the nature or sunbathe. Just a real weekend summer home for inland waterways! The "Berliner Wasserlaube" is an original design by Jörg Albrecht, which was developed in 2001 for the leisurely water walker. This can enjoy with his solar houseboat, in harmony with himself and nature, his free time on the water. The large "veranda" in the bow area invites you to stay outdoors and stop in remote bays, where it can be used as a platform for nature watching or swimming platform, sunbathing is possible on the vast area. Just a real weekend-summer boat for the inland waters. Die "Berliner Wasserlaube" ist ein ein Eigendesign von Jörg Albrecht, welches 2001 für den gemütlichen Wasserwanderer entwickelt wurde. Dieser kann mit seinem Solar-Hausboot, in Eintracht mit sich und der Natur, seine Freizeit auf dem Wasser genießen. Die Große "Veranda" im Bugbereich läd ein zum Verweilen im Freien und zum Stop in abgelegenen Buchten, dort kann Sie als Plattform für Naturbeobachtungen oder Badeplattform genutzt werden, auch Sonnenbaden ist auf der ausgedehnten Fläche möglich. Eben ein echtes Wochenend-Sommerboot für die Binnengewässer. This design study "Suncat 2000" from the Berlin´s designer Jan Petzold was elaborated by Dipl.-Eng. Jörg Albrecht in1997 as a fibre glass costruction. This design study, by the Berlin designer Jan Petzold, of the suncat 2000, was presented by Dipl.-Ing. Jörg Albrecht 1997 worked out as GFK-construction. The ship is modular and can be built in different sizes (lengths). Originally 150 passengers were planned. Diese Designstudie, des Berliner Designers Jan Petzold, des suncat 2000, wurde von Dipl.-Ing. Jörg Albrecht 1997 als GFK-Konstruktion ausgearbeitet. Das Schiff ist modular aufgebaut und kann in verschiednen Größen (Längen) gebaut werden. Ursprünglich waren 150 Fahrgäste geplant.